Browsing in a second-hand bookshop, you never know what you’re going to come across, and that’s one of the things I like about them. If you want to sell books or give some away, this is also the place to go. So here’s a small selection of bookshops in Brussels that sell either new or second-hand books in English. Let me know if you have any suggestions. Tulibris opened in October 2015 in a little side street off Chaussée d’Ixelles/ Elsensesteenweg, close to the town hall of Ixelles/Elsene. So it’s not on main street, but it’s definitely worth making a detour to go visit the shop. It not only has a good selection of fiction and non-fiction titles in very good quality, but it also has a certain style that makes it stand out. Opening hours vary from one day to the next (literally), so be sure to check before you go there. Address: rue de la Tulipe 25 Tulpstraat, 1050 Brussels. Tel. : 0475 293 123. Opening hours: Mon. 13:00-16:00. Tues. 11:00-18:30 Thurs. 11:00–18:30 Fri. 11:00-16:00 Sat. 11:00-18:30. Sun. 12:00-20:00. Closed on Wed. and Sun. Evasions expanded its English section quite a bit in recent months: you’ll find it on the first floor. They have some good titles at decent prices, and the shop is generally packed with buyers and sellers. Address: rue du Midi 89 Zuidstraat, 1000 Brussels. Tel. : 02 502 49 56. Opening hours: Mon.-Sat. 10:00-20:00. Sun. 12:00-20:00. Filigranes expanded substantially in 2015, and the English section is now in the shop’s right wing as you enter. 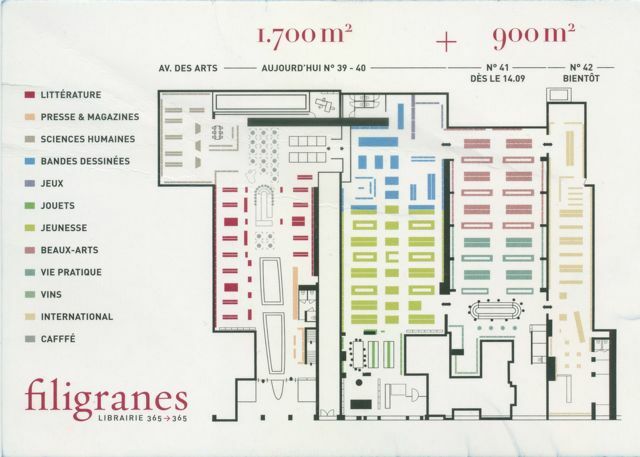 As you can see from the shop’s floor plan above, the international section is quite large and is not limited to English-language books. Address: avenue des Arts 39-40 Kunstlaan, 1040 Etterbeek. Tel. : 02 511 90 15. Opening hours: Mon.-Fri. 08:00-20:00. Sat. 10:00-19:30. Sun. 10:00-19:00. Website: Librairie Filigranes. Fnac has stores both uptown (in Toison d’Or) and downtown (in City 2). Although neither place exudes much charm, this is the place to go if you don’t like surprises since both stock a rather traditional range of titles. 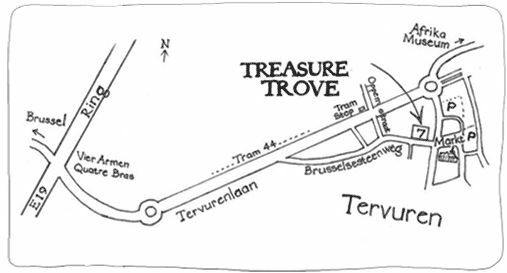 Address uptown: avenue de la Toison 17a-20 Guldenvlieslaan, 1050 Ixelles / Elsene. Tel. : 02 402 26 26. Opening hours: Mon-Thurs. 10:00-19:30. Fri. 10:00-20:00. Sat. 10:00-19:30. Address downtown: City 2, 1000 Brussels. Tel. : 02 275 11 11. Opening hours: Mon-Thurs. 10:00-19:00. Fri. 10:00-20:00. Sat. 10:00-19:00. Het Ivoren Aapje (‘The ivory monkey’) takes its name from a novel set in Brussels by the Flemish author Herman Teirlinck (1879-1967). I haven’t read the novel, but perhaps I should give it a try since I do like visiting this shop. Located on a quiet square opposite the beautiful Béguinage church downtown, the place looks (is?) dusty and a bit run-down, but it has a great selection of titles in English and other languages at good prices. Address: place du Béguinage 4 Begijnhofplein, 1000 Brussels. Tel. : 02 219 46 86. Opening hours: Tues.-Sat. 11:00-18:00. Facebook: Het Ivoren Aapje. Nijinski has, as far as I can remember, quite a decent selection of second-hand books. I haven’t been there in ages, however, since all books have non-removable anti-theft stickers which, although they might prevent people from stealing them, also disfigure the books. This is a pity, since the shop is housed in a very nice building. Address: rue du Page 15-17 Edelknaapstraat, 1050 Ixelles / Elsene. Tel. : 02 539 20 28. Opening hours: Mon.-Sat. 11:00-19:00. Oxfam has two bookshops in Brussels, one in Ixelles and one in Uccle. Both stock a wide range of English fiction and non-fiction titles. The books are generally in very good condition and reasonably priced. The thing I like about both shops is that titles don’t stay on the shelves for long, which means there are always new books to discover. Address Ixelles / Elsene: chaussée d’Ixelles 254 Elsensesteenweg, 1050 Ixelles / Elsene. Tel. : 02 648 58 42. Opening hours: Mon.-Sat. 10:00-18:00. Address Uccle / Ukkel: rue Vanderkindere 248 Vanderkinderestraat, 1180 Uccle / Ukkel. Tel. : 02 344 98 78. Opening hours: Mon.-Sat. 10:00-18:00. Passa Porta Bookshop is located in Passa Porta, the international house of literature which organizes literary events in Dutch, French and English. The shop has a pretty decent selection of titles in English and other languages. Address: rue Antoine Dansaertstraat 46, 1000 Brussels. Tel. : 02 502 94 60. Opening hours: Mon. 12:00-19:00. Tues.-Sat. 11:00-19:00. Sun. 12:00-18:00. Pêle-Mêle has two stores, one downtown and one uptown. The downtown branch has a good English section at the back of the shop with a good turnaround, so there are always new books to discover. The only thing is that it gets pretty stuffy back there, and the place rarely if ever seems to get aired. The more recent branch uptown in Ixelles also has a good selection of English titles on the first floor, and the setting is substantially nicer: it’s spatious and bright. So both are worth a visit. Address Ixelles / Elsene: chaussée de Waterloo 566 Waterloosesteenweg, 1050 Ixelles / Elsene. Tel. : 02 548 78 00. Opening hours: Mon.-Sun. 10:00-18:30. Fri. 10:00-21:00. Address Brussels: Boulevard Maurice Lemonnierlaan 55, 1000 Brussels. Tel. : 02 888 95 44. Opening hours: Mon.-Sat. 10:00-18:30. Website: Pêle-Mêle. Sterling Books used to be spread over two floors and had a nice coffe corner. These days it’s limited to two rather small rooms and there’s no coffee corner, but it’s still a good address to buy English-language books.. Address: Wolvengracht 23 rue du Fossé aux Loups, 1000 Brussels. Tel. : 02 223 62 23. Opening hours: Mon.-Sat. 10:00-18:30. Website: Sterling Books. Facebook: Sterling Books. Bouquinerie Thomas is located between Rond-Point Schuman and Place Jourdan. The shop not only extends quite far back but also stretches over the width of two houses. There are a lot of English fiction and non-fiction titles (besides other languages too). The books are reasonably priced and are all generally in very good condition. Address: rue Froissart 13 Froissartstraat, 1040 Etterbeek. Tel. : 02 513 89 66. Opening hours: Mon.-Fri. 12:00-18:00. Tropismes has a pretty small English section, but it is one of the most beautiful bookshops in Brussels so if you’re in the vicinity it’s well worth dropping in. Address: Galerie des Princes 11 Prinsengalerij, 1000 Brussels. Tel. : 02 511 56 51. Opening hours: Mon. 13:00-18-30. Tues.-Fri. 10:00-18:30. Sat. 10:30-19:00. Sun. 13:30-18:30. Website: Tropismes Libraires. Waterstone’s Brussels is located in the city centre close to Rue Neuve and City 2 and Place Rogier. The shop has a large although fairly predictable range of fiction titles, and an extensive range of non-fiction titles, newspapers and magazines as well as DVDs. They recently started stocking some French titles too. Address: Boulevard Adolphe Maxlaan 171-75, 1000 Brussels. Tel. : 02 219 27 08. Opening hours: Mon.-Sat. 09:00-19:00. Sun. 10:30-18:00. Facebook: Waterstone’s Brussels. Les Petits Riens is a non-profit organization committed to the fight against poverty and exclusion. They have various stores across the city, but in their main shop in the Châtelain area in Ixelles they sell everything from furniture and clothes to toys and household appliances. They also have a large bookshop on the ground floor, with a substantial English section covering fiction and non-fiction titles at very good prices. Address: Rue Américaine 11 Amerikastraat, 1050 Brussels. Tel. : 02 537 30 26. Opening hours: Mon.-Sat. 12:00-17-30. Website: Les Petits Riens. 3080 Tervuren.Tel. : 02 767 74 76. Opening hours: Tues.-Sat. 10:00-18:00. Sun. 11:00-17:00. Website: Treasure Trove. Audivox is a place I rarely visit. In fact, it’s a place I often forget exists. The Brussels shop is tucked away in a narrow street behind the Grand Place. It specializes in teaching materials and school books, but only has a small selection of fiction and non-fiction. And if I’m not mistaken, they don’t take bank cards, only cash. Address: rue de la Violette 25 Violetstraat, 1000 Brussels. Tel. : 02 512 87 04. Opening hours: Mon.-Sat. 09:00-12:30 and 13:30-18:00. Website: there is none. 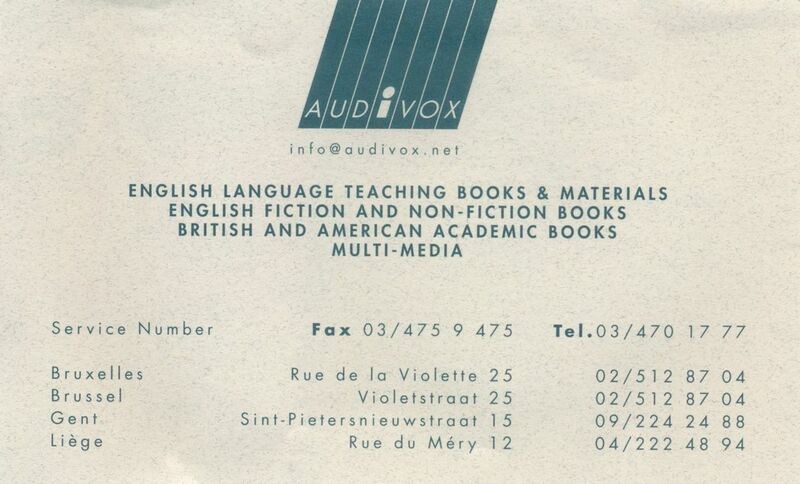 This entry was posted in Belgium, Bookshops, Brussels and tagged Audivox, Bookshops, Brussels, English books, English bookshops, Het Ivoren Aapje, new books, Oxfam Bookshop, Pêle-Mêle, second-hand books, Sterling Books, Treasure Trove, used books, Waterstone's Brussels. Bookmark the permalink. Could you please take note that the only address for the BOUQUINERIE THOMAS is 13 rue Froissart, 1040 Brussels, Tel. : 02/513.89.66. It is now opened from Monday until Saturday, from 10 am until 7 pm. Hi! considered posting something similar, but you did it first! I didn’t know all of them, so thanks a lot for your list.